Rich Mullins once wrote in one of his songs, "There is so much beauty around us, and just two eyes to see. Everywhere I go, I'm looking." In the year plus that I've started running in my neighborhood, I keep finding beauty, in silly, majestic, interesting, and awe inspiring forms. Recently, I've found myself taking pictures with my iPhone nearly every time I head out for a run. I wasn't even sure why, I just wanted to capture that moment. On my run this afternoon, I became inspired to start this project. I want to share one thing I see every time I run. My goal is to show the world I see while on a run, and share something you might not see from your car, or perhaps you just don't take the time to notice. My other goal is to keep my eyes open so I can see new things every time I go. I run three or four times a week, and I'm hoping this project keeps me looking, thinking and feeling. The weather on this first run for the blog was gloomy. It was drizzling and gray. As I drove home from work, I debated if I'd even go running, as getting drizzled on isn't necessarily ideal. I'm so happy I did go, though, as I felt amazing. I had gotten a great and long night's sleep the previous night, and all that rest meant I was at full strength. I did get drizzled on, but it was light and refreshing, and listening to 99% Invisible got me feeling like starting a new creative project. 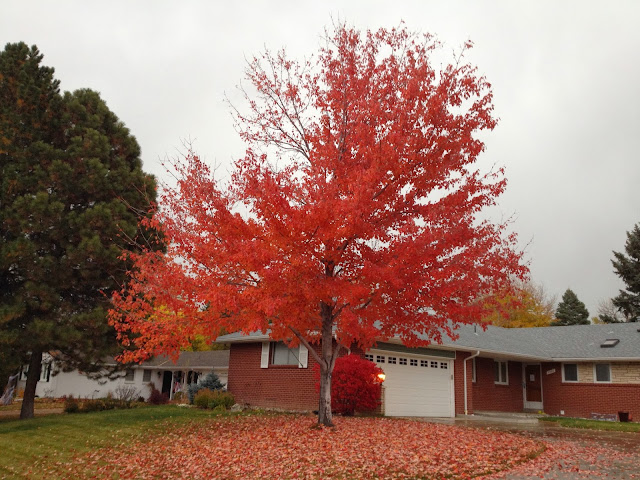 Then I came across this house with a glorious red tree. It is past it's autumnal beauty peak as many of it's leaves have fallen to the ground, yet for some reason, I was drawn to it. The leaves on the ground complimented the leaves still on the tree. I felt like I was the tree. I have a lot of personal leaves that have hit the ground, but I've still got a long way to go, and there is promise both in the legacy that I have left and the leaves still clinging to me. This tree that is losing it's leaves to fall left a feeling of hope springing in me. I was in a great mood for this run. So great, that I started this project. Hopefully, I can share both personal highs and lows from my perspective as a dude running in the suburbs. I'm excited for what may come, and happy to have something new. Leg 2 of the run.